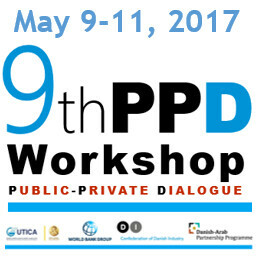 The 9th Global Workshop on “Public-Private Dialogue on Enterprise Development for Youth & Inclusion” was held at the Union Tunisienne de l'Industrie, du Commerce et de l'Artisanat (UTICA) in Tunis, Tunisia, from May 9 to May 11, 2017. This Workshop was organized by UTICA in collaboration with and through the financing of the Confederation of Danish Industry (DI). It was implemented with the support of the World Bank Group, specifically the Youth in Development program, the Collaborative Leadership for Development Network, the Trade & Competitiveness Global Practice, and the Social Protection, Labor & Jobs Global Practice. The workshop took stock of recent developments in PPD knowledge, explored how it is used to foster inclusive development, as well as critical links between competiveness, youth, gender, and migration dimensions. It also helped to build capacity of participants to effectively manage and monitor a PPD process during the PPD life cycle. During the discussions, the participants explored how the government, private sector and civil society organizations can effectively use PPD platforms together to identify the most effective means to support the full participation of young people, women and migrants in the economy and society as whole. Resilience– Nigerian Economic Summit Group (NESG): Recognition for reinventing itself many times under difficult circumstances, still standing sustainably after more than 20 years, and now stronger than ever with concrete and tracked results. Long Standing Achievements– Cameroon Business Forum (CBF): Recognition for the many years of hard work to build the capacity of a PPD to deliver concert and important results over time. Innovation– Moldova Economic Council to the Prime Minister: Recognition for using PPD in an innovative manner with an interesting new mechanism to combine permanent cross-cutting topics with ad-hoc sectoral ones to tackle specific challenging economic development issues. Click here to watch a summary video of the 1st day of the event! Follow news update on Twitter with hashtag #ppd2017 on and the PPD Facebook club.